Posted on September 15, 2016 by Kate H.
Hello to all you graveyard enthusiasts and those who often wander through cemeteries. This is Kate, taking over for Dave who spent the night watching the Paralympics and grading papers. Not long ago I was visiting Congressional Cemetery in Washington, D.C. where I maintain a garden plot. Dave gave me the task of deciding on a person at Congressional who should be featured in an installment of Grave Thursday. I decided to copy the theme of last week’s Grave Thursday and choose another relative of a conspirator. My choice bears a surname that is familiar to you. For this week we’ll look at Adam George Herold, the father of conspirator David Herold. Adam Herold was born, according to his baptism record, on January 6, 1803 in Baltimore City. He married Mary Ann Porter, born January 8, 1810 in Wilmington, Delaware, on September 11, 1828 in Washington City. At the time of his death, newspapers reported that Mr. Herold had been a Washington resident for 43 years, meaning he would have moved to the city around 1821 at the age of 18. Adam and Mary Herold had at least eleven children in the 36 years they were married. The named children were, in order, Jerome Jacob D. (1829-1837), Margaret Cecelia (1831-1904), George Christopher (1833-1834), Adam George Jr. (1835-1837), Mary Alice (1837-1917), Elizabeth Jane (1839-1903), David Edgar (1842-1865), Catherine Virginia (1846-1917), Emma Frances (1850-1874), Alice King (1851-1930), and Georgia Isabel (1904). In the Herold family plot at Congressional there are an additional two burials listed in the cemetery records as unnamed Herolds. One was buried in 1834 and another in 1845. It is possible that these two burials were additional Herold children who died very young, possibly at birth. Three of the four Herold sons (there is no documentation listing the sexes of the two nameless Herolds) died as children. Thusly, David Edgar Herold, born on June 16, 1842, was the only son of Adam Herold who survived into adulthood. The Herold family home stood at 636 8th Street (near the South East-corner of 8th and I Streets) only a few paces from the large gate which still today marks the entrance to the Washington Navy Yard. In order to support his large family, Mr. Herold worked as a clerk in the Navy Yard, eventually becoming the chief clerk in the Quartermaster department. By 1850, according to a Baltimore Sun article, Mr. Herold had become the Vice President (having formerly been an officer and the Secretary) of the Navy Yard Beneficial Society, which provided Navy Yard workers with insurance in case of disability of death. 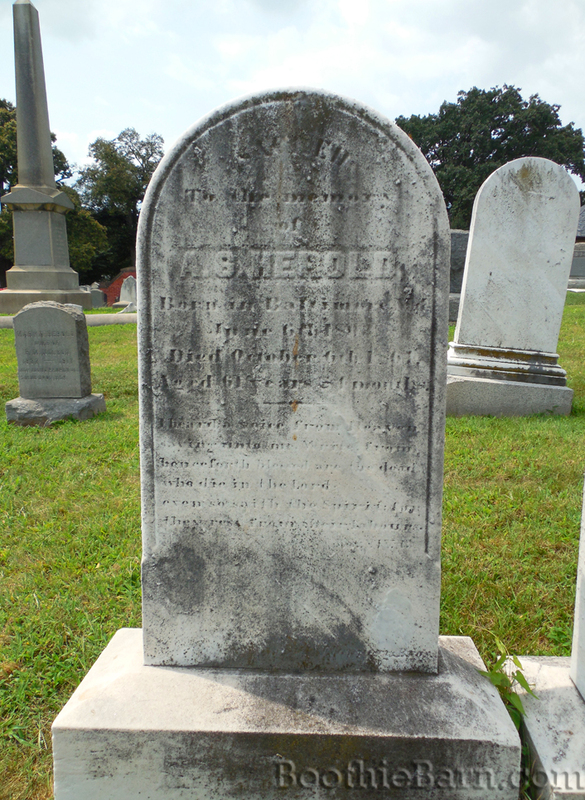 Sadly, on October 6, 1864, Adam Herold died at the age of 61 from a prolonged, but unspecified, illness. Due to his numerous years of service with various Washington societies, Mr. Herold was buried with full honors. The large procession which led the hearse from Christ Church, the Herold family parish where the funeral service was held, to Congressional Cemetery, the burial grounds owned by Christ Church where the casket was interred, was led by the members of the beneficial society and a band from Lincoln Hospital. Adam Herold’s death may have more of a connection to the Lincoln assassination than his life did. It was shortly after Mr. Herold’s death that John Wilkes Booth reignited his friendship with the then 22 year old David Herold. This friendship would lead to David becoming part of Booth’s plot to abduct, and then assassinate, President Lincoln. If Adam Herold had not died in 1864, could he have possibly advised his only son to discontinue his relationship with Booth? Did a lack of a father figure cause the young druggist clerk to attach himself to the famous and personable John Wilkes Booth? How might the history of David Herold (and maybe even the whole nation) have been different if Adam Herold had been on this earth just 6 months more? Congressional Cemetery is the final resting place of the entire Herold clan, with most of the children buried in the family plot with the patriarch, Adam George. Check out the Maps page for more details on other Herolds buried in Congressional. For more images of Adam’s son, David Herold, visit the David Herold Gallery. This is excellent and careful research and well written. Note the spelling of Herold is spelt Harold written under this historical drawing of the house sketched by McCallum..
Baker used this spelling in his book as did Harper’s press as you can see on their drawing of a different and more refined Herold, called David C Harold. Baker claimed it was he who commissioned the wanted pictures for the posters on the 20th April. The name David C Harold was on them. The unlikely question is, was there yet another person called David C Harold? Or was it Baker’s mistake? Or was it really the War Department’s mistake? They used the real picture of Herold but managed to get his name wrong. Yet as we see in many of the historical drawings, including the press, they also used the name Harold. However Lew Wallace at the trial in his portrayal of the man with the goatee beard used the name Herold. And in his oil painting he portrays Herold with a full goatee beard. This is just one of the many subtle twists in the story of David Herold whom Baker once referred to as the ‘dupe’ in his book. In response to your comment, I will point out that the wanted poster also lists John Surratt as John Surrat (second T missing) in two places. The incorrect names were most likely simple spelling mistakes caused by a rush to get the posters and, more importantly, the pictures to the public. Unfortunately, the War Department didn’t have a mass email newsletter or an HD printer spitting out broadsides by the dozen at the push of a button. In a similar sense, the press, in a rush to print stories, probably copied whatever new information was released without question. Newspapers show many examples of incorrect conspirator names being printed until proper spelling was learned. Powell is one of the biggest examples of this which is why historians still debate Paine vs. Payne. The commission members would have known the names of the people they were deciding the fates of, especially since their words often created important documents. Therefore, the inaccurate spellings ceased. The trial transcript says “Herold,” President Johnson saw it/wrote it when he approved the guilty verdict, and General Hartranft said it on the gallows. Yes I agree the press are not always good spellers but are brilliant story tellers. And one could also excuse the War Department – being so busy. Lewis Thornton Powell was known as Payne because it was the name he adopted. According to Captain William E. Doster his defence council – ‘he was the son of Reverend George C. Powell supposed to live at Live Oak Station, between Jacksonville and Tallahassee, Florida and was born in Alabama’. Doster acknowledged that Powell had saved the lives of two Union soldiers. This account of his bravery and magnanimity was provided by Mrs. Grant. And according to McFarland Press: ‘He occasionally took the name of Payne from Dr. Alban Payne of Upperville, Va. where he boarded’. And Surratt’s name was first given as John H. Surratt the assassin of Henry Seward when he reads it on Easter Monday 17th April in Canandaigua, Ontario County, NY. It was plastered over the NY papers. The spelling was correct but it was the wrong assassin. The War Department under Stanton may have mistaken the identity of Powell with that of Surratt. Otherwise where else did the press get their data – not from Baker? Our true expert on Lewis Thornton Powell and author of his biography, Betty Ownsbey, will probably weigh in on this, but I believe that “Paine” is the way the conspirator signed his oath of allegiance. And, it is probably the only signature that we have knowledge of his using the alias. Excellent response, Kate. I might add that Michael O’Laughlen (family spelling) and Louis Weichmann also “suffered” from reporters and clerks who incorrectly spelled their names. And then, there’s the case of a reporter who saw that a “Samuel Arnold” had died and wrote the story of the Lincoln conspirator. The conspiratorial Arnold read his own obituary (so to speak) and gave a lengthy account of his wartime actions in order to prove that he was still alive. History benefited from that mistake. P.S. My family was friends with Alice King Herold.